Just as promised, today, Verizon and Motorola started selling the Droid Turbo 2 and Droid Maxx 2, both of which were announced just two days ago. Needless to say, the Droid Turbo 2 is the handset that's in the spotlight, being Verizon's new Droid flagship, and succeeding the Droid Turbo from last year. The Turbo 2 is also the very first Droid that can be customized via Moto Maker. While there are over 1,000 design combinations to choose from, many of those do not look good (as in, there are plenty of color combinations that simply defy the idea of nice design). Still, most likely, everyone will be able to find at least one combination that fits their style. Interestingly, right now, the customizable Droid Turbo 2 shows up as out of stock at Verizon's website, though it can be bought from Motorola - check out the source links at the end of this article. The Droid Turbo 2 can be purchased off contract for $624 (32 GB model), or $720 (64 GB model). Prices can go up to $744 if you're choosing the 64 GB model with a leather back (available in three colors: natural, cognac, and black). Besides the 5.4-inch Quad HD shatterproof display, highlight features of the Droid Turbo 2 include an octa-core Snapdragon 810 processor, a 21 MP rear camera, 5 MP front-facing camera with flash, 3 GB of RAM, and a 3760 mAh battery. As for the Droid Maxx 2, this is a cheaper handset, being Verizon's version of the Motorola Moto X Play that's been available outside the US since August. 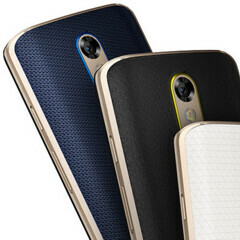 Prices for the Droid Maxx 2 start at $384 off contract. So, who's buying the Droid Turbo 2 or the Droid Maxx 2? I doubt they'll post it. But DXO scored it at 84. Giving it the 4th best camera.